In our ongoing effort to consume as much food as quickly as possible, we here at The A.V. 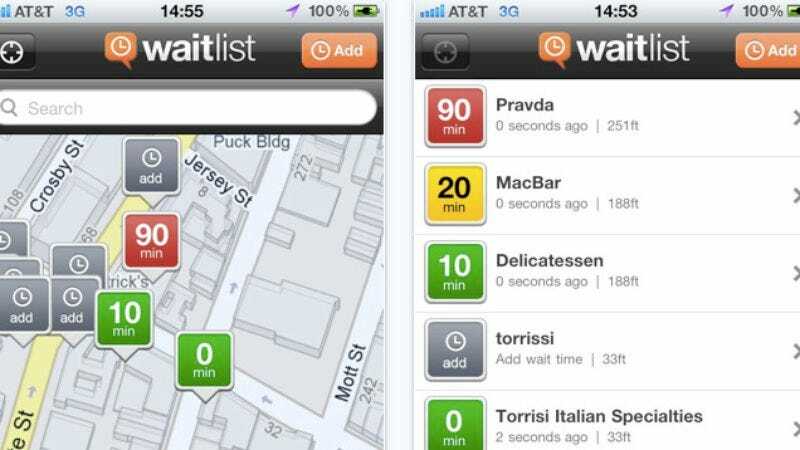 Club have been hard at work with Invoke to develop this: WaitList, an iPhone app aimed at tracking wait times at bars and eateries across the U.S. The idea grew out of our Chicago office's obsession with Anthony Bourdain-approved gourmet hot-dog joint Hot Doug's, which serves amazing dogs but at the cost of an hour-plus line. We then created a Chicago-focused tipline and Twitter feed, which grew into the nationwide app. So you don't need to live in one of our cities to use it. Just send a tip while waiting in line for a barstool or table, and next time check the app to see if it's a good time to head out or not. The app is totally free. Here's to shorter wait times.